Is tithing a requirement for Christians? Was William Branham's teaching on tithing correct? Does the tithe belong to the ministry? What does the Bible have to say about tithing? Do you have to tithe ten percent of your gross income? 1 What did William Branham teaching on tithing? 2 Does the New Testament require tithing? 3 Are Christians under the law? 4 Was the tithe ten percent? 6 How do you pay tithes to Melchizedek? 6.1 Didn't Jesus teach us to tithe? 6.2 But doesn't the Book of Hebrews require us to tithe? 7 Should the tithe go to the ministry? 8 So what does the New Testament require? 8.4 How are we supposed to use our money? What did William Branham teaching on tithing? The tithe should go to the ministry as they are the equivalent of the Levitical priesthood. My judgment is that we should not trouble those of the Gentiles who turn to God, but should write to them to abstain from the things polluted by idols, and from sexual immorality, and from what has been strangled, and from blood. A requirement to tithe cannot be found in the New Testament. For all who rely on doing the works of the law are under a curse, because it is written, “Cursed is everyone who does not keep on doing everything written in the book of the law.” Now it is clear no one is justified before God by the law, because the righteous one will live by faith. But the law is not based on faith, but the one who does the works of the law will live by them. Christ redeemed us from the curse of the law by becoming a curse for us (because it is written, “Cursed is everyone who hangs on a tree”) in order that in Christ Jesus the blessing of Abraham would come to the Gentiles, so that we could receive the promise of the Spirit by faith. Was the tithe ten percent? William Branham taught that the Old Testament tithe was ten percent. But that is simply not the truth. The Old Testament was almost double that. One-tenth of all the produce of the land, whether grain or fruit, belongs to the LORD. If a man wishes to buy any of it back, he must pay the standard price plus an additional twenty per cent. One out of every ten domestic animals belongs to the LORD. When the animals are counted, every tenth one belongs to the LORD. The owner may not arrange the animals so that the poor animals are chosen, and he may not make any substitutions. If he does substitute one animal for another, then both animals will belong to the LORD and may not be bought back. The tithe was not the giving of money. It was likely only done on an annual basis. A weekly or monthly giving of tithes of wages to the church is not what this passage is suggesting. The tithe funded the Levites (Num. 18:20–32). The Levites were scattered all over the country and were not just in Jerusalem at the temple. The Levites also included everyone in the tribe of Levi that worked in the temple - the priest, the song leaders and musicians, even the doormen and the janitors. In Nu 13:21–32 it is laid down that the tithe must be paid to the Levites, not just to the priests. According to Numbers 18:26-28, the Levites paid ten percent of the first tithe to the priests (who were also part of the tribe of Levi). It should be noted that according to Heb 7:5, ‘they that are of the sons of Levi, who receive the office of the priesthood.… take tithes of the people.’ The explanation for this is that the priests, who received from the Levites a tithe of the tithe, thus symbolically received the whole tithe. A distinct second tithe is found in Deuteronomy 14:22-27, and happened every first, second, fourth and fifth year of a seven-year cycle. This tithe is different because the person tithing gets to eat it, and not just the Levites or the Priests. The point was to bring the resources to the temple for a party (the festivals). Just in case you couldn't make it to the temple with your harvest, you were supposed to redeem the tithes for money and then go. Yes, that is right, it was spent on parties and it was mandatory. Can you even imagine if we all kicked in ten percent of our gross aggregate income for parties? You shall tithe all the yield of your seed that comes from the field year by year. And before the LORD your God, in the place that he will choose, to make his name dwell there, you shall eat the tithe of your grain, of your wine, and of your oil, and the firstborn of your herd and flock, that you may learn to fear the LORD your God always. And if the way is too long for you, so that you are not able to carry the tithe, when the LORD your God blesses you, because the place is too far from you, which the LORD your God chooses, to set his name there, then you shall turn it into money and bind up the money in your hand and go to the place that the LORD your God chooses and spend the money for whatever you desire—oxen or sheep or wine or strong drink, whatever your appetite craves. And you shall eat there before the LORD your God and rejoice, you and your household. And you shall not neglect the Levite who is within your towns, for he has no portion or inheritance with you. So why do Christian ministers teach about the first tithe only, and forget about the party tithe? You could say it is because Jesus cast out the money-changers, and those that sold animals in the temple. But what Jesus was doing was cleansing the temple from those who were in it for the money. Ten percent every third year went to help the poor (Deut. 14:28, 26:12-15). That’s 3.33 percent. In addition, there were gleanings for the poor and the alien. If your pastor preaches that tithing is mandatory for New Testament Christians, does this include tithing to strangers, or only to preachers? James 1:27 says, "Pure religion and undefiled before God and the Father is this, To visit the fatherless and widows in their affliction, and to keep himself unspotted from the world." What James experienced in the New Testament is believers who gave everything, and shared it with those in need. It was a religion of love for others from the heart. The law, after all, was just a schoolmaster leading to true faith. In addition, there were occasional tithes and offerings as a specific need would come up, i.e., the rebuilding of the wall in Ezra, Nehemiah, or with the creation of the tabernacle in Exodus. If you add that up, the total mandatory tithe was about twenty-five percent of your gross income. On top of that, there were specific sacrifices and gifts that you were expected to give just out of joy, as particular needs arose. What that means is, no matter how you look at it, the tithe was well above twenty percent, depending upon the year, of your gross income going to your tithe. And then, your taxes, and then you live on whatever is left. What is also clear is that the priests only got a small portion of the total tithe (ten percent of ten percent = one percent of income). Every seventh or sabbatical year the land lay fallow, and was then tithe-free (Leviticus 25:4-5 and Deuteronomy 15:1). But since you didn't have any income from the land, you couldn't really pay a tithe in any event. The "multiple tithe" position is held by Adam Clarke, Albert Barnes, Matthew Henry, Jamieson, Fausset, and Brown, Bruce Metzger, Charles Ryrie, the Jewish Talmud and most Jewish writers, like Josephus. Many message ministers (as well as denominational pastors) use the argument that, because Abraham paid tithes to Melchizedek, we are obligated under the Abrahamic covenant to pay tithes to the church. Abraham was not under obligation to pay tithes, he paid them freely. There is no evidence in scripture that Abraham was required to pay a tithe. Abraham only paid tithes once in his life, not every year. Abraham didn't tithe on his income but just on his plunder from war. Abraham also was required to be circumcised as part of the covenant, does that mean that circumcision is also required today? Christ redeemed us from the curse of the law by becoming a curse for us—for it is written, t“Cursed is everyone who is hanged uon a tree” — so that in Christ Jesus the blessing of Abraham might come to the Gentiles, so that we might receive the promised Spirit through faith. The Bible never states that God commanded Jacob to give Him a tithe. Along with Abraham's example, it appears that the giving of this tithe was voluntary on Jacob's part. There is no evidence in the text to suggest that tithing was the general practice of Jacob's life. If he did in fact begin to tithe after God fulfilled His promises to him, Jacob still delayed tithing for 20 years! What is also important is the question of how he gave this tithe to God. Was it through sacrifice or by giving to the poor? There is no indication that he ever met Melchizedek. In Abraham's life it appears that we have a tithe of the spoils of military victory given to God's priest on a one time only basis. Is the only evidence to obligate believers under the New Covenant to tithe resting on these two passages in Genesis? That's it? Quit their job and buy a farm so that they can raise herds and grow crops. Find some Levitical priests to support. Use their crops to observe the Old Testament religious festivals like Passover, Unleavened Bread, Pentecost, and Tabernacles. 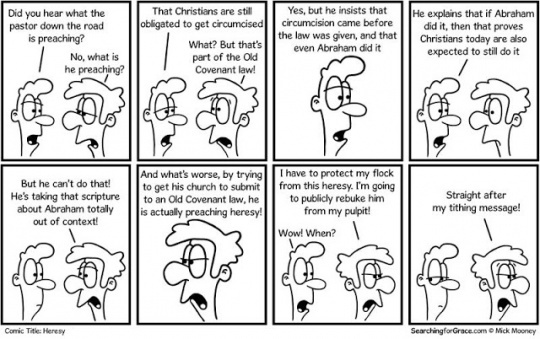 Since they are under the Abrahamic Covenant, the men would also need to be circumcised. Begin by giving at least 20 per cent of all their crops and herds to God for the first six years. Pay no tithes every seventh year. Expect God to curse them with material deprivation if they were unfaithful or bless them with material abundance if they were obedient. How do you pay tithes to Melchizedek? “For the priesthood being changed, there is made of necessity a change also of the law”. And Jesus Christ is alive today, our priest forever. This means that your pastor is not a symbol of a priest who should receive tithes. No, Jesus is our high priest, and he is sitting on His throne in heaven (Hebrews 8:1). So how do we give to Jesus? Do you believe that your pastor fits into the role of vicarious fillii dei? Can he receive tithes as a representative of the Son of God, or as a representative of Melchisedec? Jesus was not talking about the least being a pastor in a luxury car, with luxury clothes and a luxury home. He was talking about people who were hungry, thirsty, naked, sick, in prison, and strangers. These are the words of the King. And Melchisedec, after all, is the King of righteousness and peace. If you truly want to give your tithes to Melchisedec, give to those in need. Didn't Jesus teach us to tithe? The tithe here is a tenth of their spice crop, not ten percent of their monetary earnings (Leviticus 27:30 "A tithe of everything from the land..."). Jesus is correcting the Pharisees. He is speaking directly to them. This is before the cross, and therefore, the Pharisees are clearly under the law. What was happening was that the Pharisees were getting a lesson in the law from the one that wrote the law. What Jesus is saying is not aimed at Christians, who are under grace and not under the law. Jesus wasn't endorsing Abraham's tithe. Jesus is simply confirming that tithing is part of the law, not something that was before the law. Remember Jesus fulfilled the law so that we don't have to. But doesn't the Book of Hebrews require us to tithe? See how great this man was to whom Abraham the patriarch gave a tenth of the spoils! And those descendants of Levi who receive the priestly office have a commandment in the law to take tithes from the people, that is, from their brothers, though these also are descended from Abraham. This verse states that the tithe is collected by the priests. Doesn't 1 Peter 2:9 state that we are part of a "royal priesthood"? Weren't the priests the only ones that didn't have to tithe? So just tell your pastor that you're going to go out and fight some people and he can have ten percent of anything that you take from the people that you beat up. OR NOT! Should the tithe go to the ministry? We have already proved that there is no requirement for tithing in the New Testament. And we have shown that the priests only received a tithe of the tithe (i.e. one percent). But if for some reason, you want to ignore scripture and tithe, then you have to ask the question: Who gets the tithe? We take this course so that no one should blame us about this generous gift that is being administered by us, for we aim at what is honorable not only in the Lord’s sight but also in the sight of man. Paul was given a large gift from the church to take to Jerusalem, which of necessity had to be physically taken from places so far away to Jerusalem that it would inevitably raise questions as to its vulnerability to misuse. Paul was deeply sensitive to any negative inferences in relationship to himself in this matter, as is clear from this verse. He held himself accountable to God and to man. His decision was that local church delegates would accompany the monies, thereby ensuring an independent accountability for the money. Paul didn't want the money and neither should message pastors. A minister should get paid a reasonable wage - not the highest and not the lowest in the congregation. We believe that the Bible teaches that. But what is not acceptable is also one of the most telling features in most message churches - a complete lack of accountability with respect to the tithes of the church. Ministers for the most part have total control and the trustees who are legally charged by the law to ensure that there is accountability for the funds turn tail and run. As a result, monetary misuse and abuse of tithes in message churches is the norm. Trustees and boards refuse to hold the ministry accountable and so the ministry simply walks away with the money. While this is not the case in all message churches, it is the case in most. So what does the New Testament require? Those who have more should give more. Now concerning the collection for the saints: as I directed the churches of Galatia, so you also are to do. On fthe first day of every week, each of you is to put something aside and store it up, as he may prosper, so that there will be no collecting when I come. Notice that Paul does not tell them how much to give, or give them a fixed percentage as a standard. He simply tells them that whatever they have decided to give they should go ahead and give. We are not to allow others to manipulate or intimidate us so that we give out of guilt or pressure. There is to be no compulsion in our giving; the amount must be our own decision. How are we supposed to use our money? Everything we own is God's. We are simply His stewards. So what are we supposed to do with the money that he has placed on our care? Or is it only Barnabas and I who have no right to refrain from working for a living? Who serves as a soldier at his own expense? Who plants a vineyard without eating any of its fruit? Or who tends a flock without getting some of the milk? Now watch this if you want to see something. He had to be greater. That's the priesthood of the order of priests and preachers, and so forth. Men that receive tithe, die. See? ... but here he receiveth them, of whom it is witnessed that he liveth. What would a man take tithings for, if he had any... If he never was born, and never will die, and was from beginning to end, and--and never had no father or mother or descent, and owned the whole Heavens and earth and all in it, why would he take tithe? Why would he ask Abraham to pay tithes? You see what a strict thing it is to pay tithes? Tithing is right. Every Christian is duty bound to pay tithe. That's right. Never has been changed. He can do nothing till first you confess that He's did it, and accept it as your own personal property. You can't get saved by beating on the altar, or can't get saved by paying your tithe, or keeping some days, or abs--abstain from meats. You don't get saved by that. It's by faith are you saved, and that through the grace of God. You have to accept it first, and believe it as your own personal property, then you are saved. Same way by healing. God will provide the works. If you'll just walk in grace, you'll be more at work than you are right now with the Ladies Aid Society and all this other nonsense that's been added into the church. Soup suppers to pay the preacher, where'd you ever get such a thing as that Scripture? Tithes pays the preacher. He's to live by the tithes of the people. But we had to get something else to do. We have to have our part into it. And then if the--they can't make it up, there's another society will do it, another society. God's way is right. Tithes and offerings goes to Levi, which was the minister. If everybody would pay their tithes you wouldn't have to have any soup suppers. See, you adopted something else and leave the tithings off. Say it's an Old Testament ar--argument. I'd like for you to prove it to me. That's right. You can't do it by God's Word; it's a New Testament order too. God makes one order, it can never be changed. It has to remain that way.THE.CHURCH.CHOOSING. Can a Christian go to heaven if he or she does not pay tithe? Now, that's one that I could not answer Scripturally. Now, this "Father, Son, and Holy Spirit," if the minister is sincere, just let--let us know (You see? ), we'd be glad... Brother Neville, myself, or Brother Beeler, or Brother Collins, or any of these ministers here who are ordained to this ministry, and so forth, can--can do so. Now, but now: Does a Christian not get to heaven because they do not pay tithe? I--I could not say yes or no to that. But I do believe that every Christian is obligated to pay tithings because it is a commandment of the Lord. "And blessed is--are they that do all His commandments, that they might have a right to enter into the Life, the Tree of Life." :Now, I do believe that tithe-paying is essential to a Christian experience. For I'll get to that in another question in a few moments; I know there's another one in here pertaining to that. Brother Branham, don't you feel that everyone who claims to be a Christian should pay tithes, pay their tithes into the storehouse of the Lord? Please give Scripture to this question. All right, if you will... That is right, that the Bible said in Malachi the 4th chapter, "Will a man rob God? And you say, 'Where have we robbed Thee?' In tithe and offerings. Bring all your tithe and offerings into My storehouse and prove Me," saith the Lord, "if I will not open up the windows of heaven and pour out a blessing that there'll not be room enough to receive." That's a challenge to any individual. And if I only had the time, and would not get to this little Scripture that I wish to get to in about the next ten minutes, I would like to give you a personal testimony of how that I was even hungry, and my mother and them hungry, and my daddy sick, but I took my tithes out first and give it to God, and you ought to see what happened. I have never seen in my life, that any man or a woman, that if you only make one dollar a week, will bring the ten cents of that money and put it into your storehouse, your church where you come, if God don't bless that, call me a hypocrite. Yes, sir. That's a challenge to anybody. And every Christian... That goes to this other question. Every Christian should pay tithes. That's right. It should be done. Would it be wrong to use tithes on church building funds? Well now, here--here's a touchy little thing for the church now. No, correctly, tithes is to go to the minister. That's right. In the Bible they had a box they'd set at the door in the Old Testament when the--building. This box was a fund where the people put in there for the repairing... You've read it many times in the Old Testament. They kept up the buildings and things like that... All the repairs on the buildings was taken care out of that fund. But a tenth of that went--a tenth of the tithings--all the tithings went to their priests, their pastors. Yes, tithings are to go for nothing else. I know people take their tithes and give them to a widow woman. That's wrong. If you've got anything to give the widow woman, give her, but don't give her God's money. That's not yours in the first place. That's God's. If you sent me downtown to get a loaf of bread, and you give me twenty-five cents to get the loaf of bread, and I met somebody on the street wanted something else, and I'd give him the twenty-five cents (See? ), I give them your money. If they asked me for something, let them get it over here in this pocket and give them my money; but this is your money. And a tenth of it is the Lord's. And Levi the priest could live by the tenth. The tenth is to be a tithing that's to be brought into the storehouse with a promise of God to bless it and a proof. He said, "If you don't believe it, come and prove Me and see if I won't do it." See? That's right. The tithings goes into the church for the pastor and so forth like that to live on. And then the--the--the building funds and things like that is a separate fund altogether. Now, that--that is Scriptural. One time when we get started, I want to take a night... I've went here some time ago before I left the tabernacle and taken about two or three weeks and just on subjects like that and went plumb through it and showed what tithings was in the church. Should a person pay tithes to an individual, or should a Christian work? Sure he should. He's the one man that will work, is a Christian. "Pay tithes to an individual?" It depends on who the individual is. See? That's right. In Hebrews 7, the first time tithings was talked about in--in a stand that we... Wait a minute, I believe, number two question. No. Uh, uh. No. For Brother... Said, "Two questions for Brother Branham." When... In Hebrews the 7th chapter, when Abraham, returning from the slaughter of the kings met Melchisedec, he paid Him a tithe. That was Melchisedec, the King of Salem, which is King of Peace, and King of Righteousness, which was nobody but God Himself. See? But when you pay tithings... Really, where you owe tithings is where you get your food. "Bring ye all your tithings into My storehouse, saith the Lord. (That right?) And prove Me wherein saith God, that if I'll not open the windows of heaven and pour out a blessing that you would not have room enough to receive it." I challenge any man or woman that's not a tithe payer to accept that. I could stand here till in the morning, telling you just what happened when I seen that, and what condition I was in. But just as loyal as I ever could, I paid tithes. And when I took my own money from the church here or from my campaigns, I'd take more... I'd give a tenth. Then I'd give it out to the ministers, and give the rest of it to ministers. Then when I couldn't do that, then the thing I did, I kept ten percent and give God ninety. And then, when the law told me I couldn't do that, I'd have to take... And if I did, it was going to be charged to it, then I had to take and bypass it into foreign missions and so forth, and then just take a wage out of that of a hundred dollars a week; and I pay my tithes from that. Yes, sir. I believe in paying tithes. It's one of God's blessings that's proven to be a blessing. You say, "That's of the Old Testament." It is of the New Testament too. Yes, sir. ↑ The Holy Bible: English Standard Version (Wheaton: Standard Bible Society, 2001), 2 Co 9:7. ↑ Biblical Studies Press, The NET Bible First Edition; Bible. English. NET Bible. ; The NET Bible (Biblical Studies Press, 2006), Ga 3:10–14. ↑ Biblical Studies Press, The NET Bible First Edition; Bible. English. NET Bible. ; The NET Bible (Biblical Studies Press, 2006), Ga 5:4. ↑ American Bible Society, The Holy Bible: The Good News Translation, 2nd ed. (New York: American Bible Society, 1992), Le 27:30–33. ↑ Paul Levertoff, “Tithe,” ed. James Orr et al., The International Standard Bible Encyclopaedia, Volumes 1–5 (Chicago: The Howard-Severance Company, 1915), 2987. ↑ The Holy Bible: English Standard Version (Wheaton: Standard Bible Society, 2001), Dt 14:22–27. ↑ Mark Driscoll, Mark Driscoll Sermon Archive 2000-2004 (Bellingham, WA: Logos Bible Software, 2000). ↑ The Holy Bible: English Standard Version (Wheaton: Standard Bible Society, 2001), Ga 3:13–14. ↑ American Bible Society, The Holy Bible: The Good News Translation, 2nd ed. (New York: American Bible Society, 1992), Ge 28:20–22. ↑ The Holy Bible: English Standard Version (Wheaton: Standard Bible Society, 2001), Mt 23:23. ↑ The Holy Bible: English Standard Version (Wheaton: Standard Bible Society, 2001), Ro 7:6. ↑ The Holy Bible: English Standard Version (Wheaton: Standard Bible Society, 2001), Heb 7:4–5. ↑ The Holy Bible: English Standard Version (Wheaton: Standard Bible Society, 2001), Heb 7:18–19. ↑ The Holy Bible: English Standard Version (Wheaton: Standard Bible Society, 2001), 2 Co 8:20–21. ↑ The Holy Bible: English Standard Version (Wheaton: Standard Bible Society, 2001), 1 Co 16:1–2. ↑ The Holy Bible: English Standard Version (Wheaton: Standard Bible Society, 2001), Ac 11:27–30. ↑ The Holy Bible: English Standard Version (Wheaton: Standard Bible Society, 2001), 2 Co 9:6–8. ↑ Biblical Studies Press, The NET Bible First Edition; Bible. English. NET Bible. ; The NET Bible (Biblical Studies Press, 2006), 1 Ti 5:8. ↑ The Holy Bible: English Standard Version (Wheaton: Standard Bible Society, 2001), Ac 2:44–45. ↑ The Holy Bible: English Standard Version (Wheaton: Standard Bible Society, 2001), 1 Jn 3:17. ↑ The Holy Bible: English Standard Version (Wheaton: Standard Bible Society, 2001), Ga 6:9–10. ↑ The Holy Bible: English Standard Version (Wheaton: Standard Bible Society, 2001), 1 Ti 5:17–18. ↑ The Holy Bible: English Standard Version (Wheaton: Standard Bible Society, 2001), 1 Co 9:6–7. ↑ The Holy Bible: English Standard Version (Wheaton: Standard Bible Society, 2001), Php 4:15–18. ↑ The Holy Bible: English Standard Version (Wheaton: Standard Bible Society, 2001), Eph 4:28. ↑ The Holy Bible: English Standard Version (Wheaton: Standard Bible Society, 2001), Jas 1:27.